It seems like life in this high speed technological era is deluged with new advancements every second. This bombardment puts us into a hypnotic state of addiction to cyberspace where we find connections with others but not ourselves. The more we partake of advances in cyberspace the more we need to become aware of feeding our “inner space” – the energy that powers our mind, feelings and spirit. We are more aware than ever of healthier eating habits and an appreciation of food’s nutritional value. We are learning that foods of the earth – fruits & vegetables and spices & herbs, or rainbow foods – are our real medicine chest. What many people don’t know is that the outer colors of fruits & vegetables can help power our “inner space” physically invisible to the human eye. News reports linking the bio-chemicals in the pigments of fruits & vegetables to health are coming out daily. Doctors and nutritionists emphasize guidelines for consuming them. In fact, it is recommended that we have a minimum of two and a half cups of vegetables a day to help us thrive. Each color (red, orange, yellow, green, aquamarine, purple and violet) is related to a different phyto-chemical that has particular health benefits. It is the color pigments that are the heroes. They are the real super nutrients and these are as important to our health as vitamins and minerals. While the importance of eating colorful fruits & vegetables (or rainbow eating) for our physical health is at the forefront of the news, that is only half of the story – the biological part. The other half of the story is how colorful fruits, vegetables and herbs also nourish soul consciousness – the psychological, emotional aspects of ourselves. How can that be? Well, we have to see ourselves as having two bodies. One is physical, that you can experience with the senses. The other is what we call metaphysical: invisible to the human eye. We feed our physical body with foods. We feed our non-physical body with subtle energies – vibrations given off by colors in foods, sound, even thoughts. Just as our physical body has bones, muscles, nerves, and cells, our non-physical body is a network of energy centers that power all of our bodily functions. The major energy centers (known for thousands of years as “chakras” in Eastern philosophy) are located along the spinal column, from its base up through the top of the skull. Each energy center has its own color frequency (red, orange, yellow, green, aquamarine, purple and violet). When we consume a food of a similar color or frequency, we feed that energy center. When we know which colorful food feeds which energy center, we can heighten psychological and spiritual energy. As you feed your energy centers, you feed your soul. Depending on the chakra’s location in the body, the chakra emits a different color: red, orange, yellow, green, purple and violet. Each chakra color has an emotional theme that corresponds to its placement or area of the body. You can easily see why this is so. The red chakra, closest to the ground powers movement of feet and legs. It has to do with our feeling grounded, and our ability to move forward in life. The orange chakra in our reproductive area corresponds to sensuality, creativity and going with the flow in life. The yellow energy in the stomach area is responsible for digesting life with self-confidence and wisdom. The green chakra located near the physical heart gives us emotional heart – it regulates our love, forgiveness, nurturing. The aquamarine or throat chakra powers the flow of our words – our ability to speak up. The purple chakra or third eye is a conduit to our sixth sense, our intuition. The violet or crown chakra, the closest to the heavens powers our connection to divine wisdom. The frequencies in colorful foods can help strengthen a weakened emotional energy center. 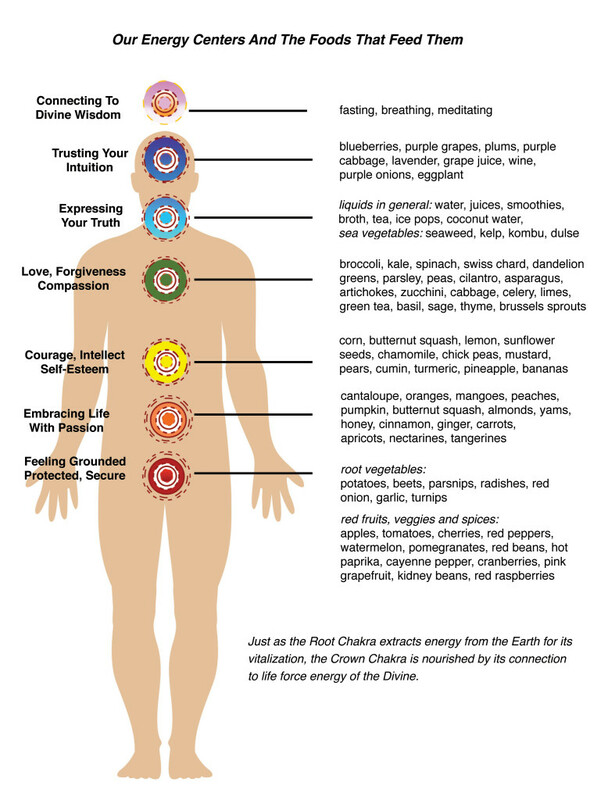 The chart below shows you the colors and locations of chakra energies and the colorful foods that feed them. Very often, several or all chakras can be out of balance. Different life situations create different challenges for us. Our energies are always changing. That’s why it is good to familiarize yourself with all the colors so that you are prepared to bolster any of the underactive energies of the chakras. In The Secret Powers of Colorful Foods you will find much more information that helps you select the colorful foods you need to support your emotional energies. Once you see fruits & vegetables according to the colors your feelings need, you have an empowering way to enhance your life!